According to a story in the Kearney Hub, water is now flowing into Elwood Reservoir, http://www.kearneyhub.com/news/local/article_b2d2607e-173a-11df-96b3-001cc4c002e0.html . I have not been to Elwood lately, but I do know there was some ice-fishing there this winter. With water flowing into Elwood, you better double-check ice conditions if you plan to do anymore ice fishing there this winter. There is enough water back in the North Platte system that the plans are to fill Elwood and deliver irrigation water out of it this summer. That will mean filling Elwood by the first of June and then sending water to irrigators for the rest of the summer. Elwood has always had significant summer drawdowns, but with water available it had some re-filling in the fall and then was filled all the way by the next June to start the whole cycle over again. Those fluctuations may not be ideal for the production of fish, but at least that was better than the last few years where we were lucky to have any water diverted to Elwood. Speaking of that, those water deliveries during the drought were pretty much done to keep the fishery alive. Now that the reservoir will be filled again we will not have to “start from scratch”; in fact there is an excellent population of wipers in Elwood right now as well as some walleyes, channel catfish, white bass and other species. I expect the fishing this year could be a challenge with all the terrestrial vegetation that will be flooded at Elwood, but there are fish there right now! The water that was diverted into Elwood during the low water years was not free, angler dollars were used for some of that water, but that was done to buy us time until there was enough water to fill Elwood again. Thank goodness we were able to keep at least some of the Elwood fishery alive through the drought and hopefully Elwood is well on its way back to being one of the top fisheries in the state! With all the flooded vegetation at Elwood we have already stocked some yellow perch that normally would not have been stocked. Additional stockings of panfish may occur this year. The newly flooded terrestrial vegetation will provide ideal habitat conditions for those panfish species, and we will try to take advantage of that. But, let me caution anglers that eventually that flooded terrestrial vegetation will decay, Elwood will at least have annual water level fluctuations, and over time habitat conditions for yellow perch and other panfish species will NOT be as ideal as they are now. Anglers should expect a temporary boom in fishing for some species that thrive in the “new reservoir” habitat conditions, but do NOT expect the fishing for those species to remain at a peak for years to come. 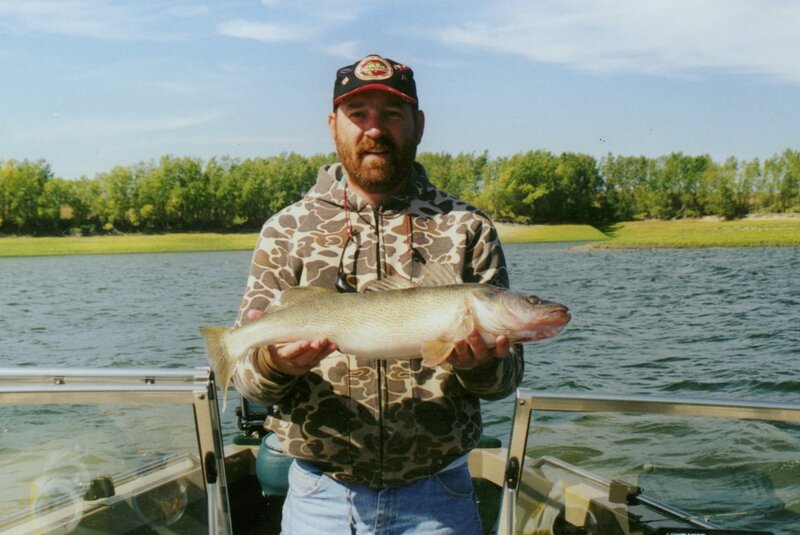 “When life gives you lemon, make lemonade”, but over the long-term expect that Elwood will primarily provide the walleye, wiper, white bass, channel catfish and muskie fishery that it has provided in recent years along with a few other “bonus” species thrown in there. I still have no real updates on the Red Willow situation–minimum pool, still investigating the extent of the problem and trying to figure out what can be done about it. I have posted a link to Red Willow updates in one of my earlier posts, https://barbsandbacklashes.wordpress.com/2010/02/08/im-back-some-reservoir-updates/#more-623 . Everything I have heard indicates that this may take awhile; maybe years. We will hope it does not take that long, but I thought I would mention it so folks do not expect a quick fix. Hopefully we are on our way back to better days at Elwood Reservoir, days like this! I guess I should have read your ‘Barbs and Backlashes’ about Elwood before I sent you that e-mail last week (about how to fish Elwood). Anyway, I was just wondering what year, and when (e.g. Memorial Day weekend), the above picture was taken. That’s definitely a nice walleye. That fish was taken a few years ago; I could go back and look it up; it was mid-90’s. It was caught in October.